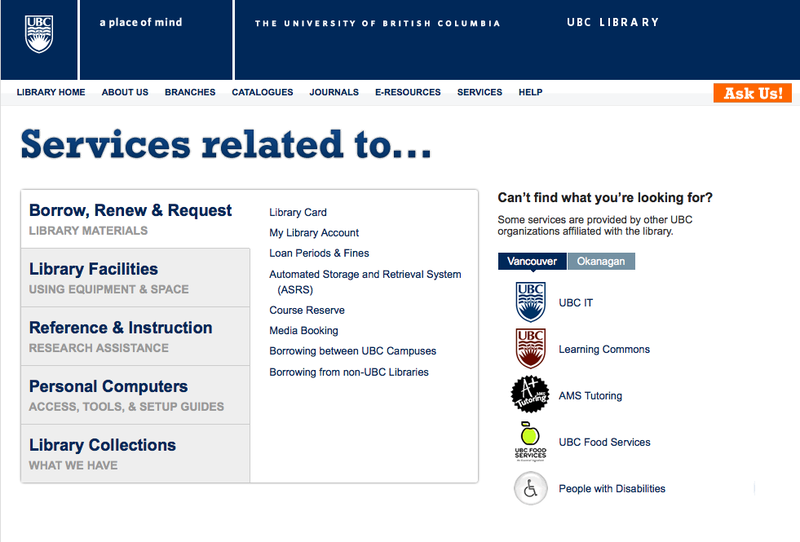 Not many people know, but when I began my current project/job, I was hired to revamp the Instructional Resources pages of the library website. Essentially, it was two pages. That’s right, two. Of course, trying to compile a list of all the instructional resources at such a large university still took a long time. And since part of the goal was to centralize these tutorials into one place and also migrate them to wiki, a whole web portal came out of it, which of course involved various staff and committees. The idea was to get it all done by the end of summer, but of course, because the tutorials also needed updating, that didn’t happen. To date, we have not migrated even half of the Help portal (of the list you see under Finding, only Journal Articles comes from the wiki). Nevertheless, we launched the portal page itself. Out of my work on the one portal grew the plan for another portal, the purpose of which was to list the services the library provide. Our library has apparently never had such a page, which seemed odd to me, but true (I had never known of a page like that in all my time here). Interestingly, this portal had much more user testing than consultation with others, because it was putting together a new portal and would not affect any existing parts of the website. We also rethought the design so that we minimize the amount of screen space we’d be using and in our testing, we found people had no problems with the navigation and those who tended to skim through pages found this design better/more useful than the older Help portal design, because they were forced to read the headings to move further on, and thus were more likely to read them than to skim. Although some pages have yet to be migrated into WordPress/wiki, most of it is done even if it’s not all public. We prefer not to change things so close to the end of term (especially since some of them are really popular pages) and there’s a bug or two that need to be fixed with the WordPress pages. Soon though, I hope. So with Services launched, the plan for this term was basically the rest of the main site minus the home page (and Branches since that only really needs a migration). 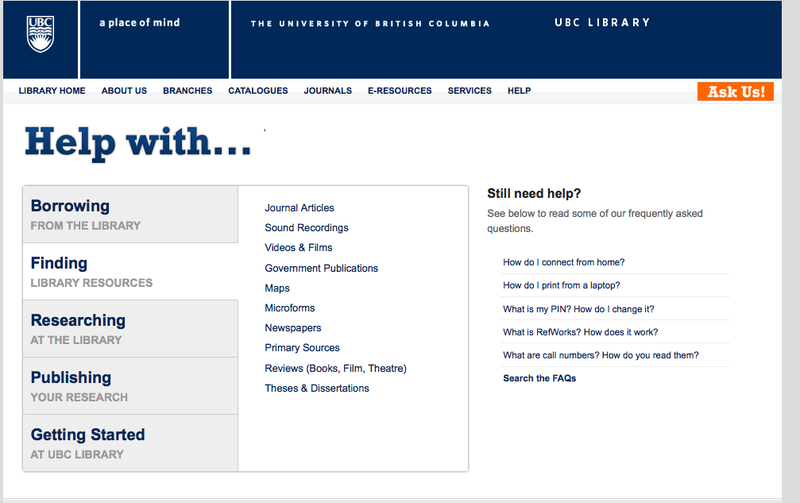 One is the Find Portal to replace the current navigation of Catalogues/Journals/E-Resources, and the other is About Portal to replace the current About Us section. It became fairly clear a few weeks ago that due to the need to prioritize other projects, my co-worker was not going to be available to do usability testing for the two new portals. After discussions with my supervisor, we decided that we’d have to push the timeline back for testing and we could really only go as far as preparing for it. Nevertheless, we’ll be pushing forward with About since that’s an area that is not used quite so much by our users and most of the decisions would come from other divisions. Find will go as far as a prototype site with preparation for usability testing. Unfortunately, I struggled with the organization of the Find Portal, so another look will be needed before and after usability testing. Here’s hoping that the new timeline goes through. So, beyond launching the actual portal pages, a lot of work has continued with migrating everything to WordPress and encourage staff to help update existing pages or provide us with new content. As I mentioned, much of Help is still simply linking to old pages (some were so out of date, we had to take them down), but Services is moving along and I hope to get it all done by the end of next month. Nevertheless, as all websites, it’ll be continual project that will be taken up by the rest of the team (and perhaps a new co-op student in the summer). Apologies for the lack of updates, but although I’ve been fairly busy, there hasn’t been much to report on. I’ve mostly been busy migrating old pages, consulting with others, providing wiki workshops, and preparing for the new portals. So far, I’ve done a content analysis, much like before, by doing an inventory and looking at what to keep, consulting with various people to see what we might add, and developed an IA for the two based on the inventory and consultation. Things have been a little slow to develop because my co-worker is on vacation, but it’s coming! We will not be doing pre-design usability testing as we did before (i.e. no card sorts), because we just don’t feel that the two portals in development warrant it. Instead, we’ll be focusing on usability testing after the prototypes are completed. Most likely, it will be a focus group, since they’re not very suitable for task oriented usability testing. That’s it for now I think, will post some more updates later!